We left Friday night and our otherwise on-time plane was delayed about two hours by a passenger who apparently was too scared to fly. The pilot said he has been flying since 1981 and has never had to let someone off a plane because he was afraid to fly — and that he was scared of what the passenger might do if forced to fly. Apparently he had some sort of “crazy look in his eyes.” We didn’t really notice any commotion, though. It just felt like a lot of waiting. The delay, subsequent search of the plane and refueling, put us into Barcelona late. We had a light dinner at Bernat and Miriam’s apartment, where we stayed, and rested up for the next day’s activities. 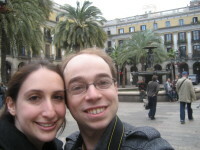 Evan and I started the day by checking out the main cathedral, walking down the the sea, strolling up La Rambla and some other big streets, and checking out some of the many back alleys. We met up with Bernat and Miriam at the Santa Caterina Market, where we saw all sorts of meats and fishes (we got some good photos, coming soon) and Spanish foods. After buying plenty of food, it was time to head out of the city and towards the mountains. Our first stop was Montserrat, the monastery and church high up in craggy mountains. We walked around a bit, had lunch and checked out the sanctuary. The views were great, though we didn’t stick around too long — we were heading further into the mountains to visit Miriam’s brother. By the time we got to his house, in the foothills of the Pyrenees, it was dark and rainy. We made a big dinner over an indoor fire pit, drank wine, played games and watched movies. I also got to practice my fake — or more like paltry, though never actually learned — Spanish. Evan said was better than his fake French, though, and gave me plenty of help putting together phrases. We forgot how quiet it could be away from the city, and we woke up the next morning to birds chirping outside. In the morning, we walked around outside and enjoyed stunning views of snow-capped mountains, then took a short walk to a small church. On the way back, we ran into Miriam’s brother, who let us take turns riding one of his horses. I don’t even remember the last time I was on a horse, so it was quite a treat. Late in the afternoon, we had lunch, relaxed, and finally said our goodbyes, smelling of wood smoke. That night we had dinner, and the next day, Easter, Evan and I headed to Parc Guell, a huge modernist park on a hill with views of Barcelona and the Mediterranean, and plenty of bizarre buildings, sculptures, structures and mosaics to check out. We continued our Barcelona tour with a trip to Casa Batllo, the Gaudi apartments, which looked like a house for a family of mermaids. The tiles, ocean theme and undulating spaces were fun to walk through, and from the roof, we saw plenty more buildings we wanted to check out. We ended up at the Parc de Ciutadella at sunset, where the sky glowed peach, pink and blue behind the Arc de Triomf, and we took a stroll around the lake and headed back to the apartment to relax before dinner. We went out for drinks, dinner, and drinks again, and left the next morning, flying out over the blue sea and snow-capped mountains, to come back to London. What an amazing weekend. We couldn’t have asked for better hosts for our trip — we felt like part of the family and saw a side of Barcelona and the Spanish countryside neither of us had ever seen. I can’t wait to go visit again, and I can’t wait to look through all the photos Evan took on his new camera. Update: Photos are up on Evan’s site.